For years, the Marvel Select Thanos was the best version of the character in toys. Now they've made a new one. There's no text on the back of the packaging, but by now, you know who Thanos is: he's the big purple space-daddy who people want to choke them. The internet is a weird, weird place. This figure is allegedly based on 2013's Infinity series, the same limited series that introduced Thanos' cadre of knockoff New Gods. 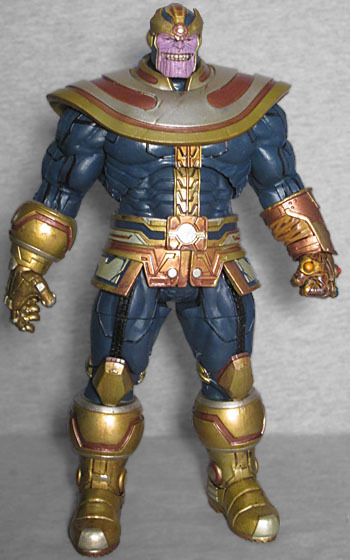 Of course, you (being a clever netizen and a regular reader/​follower of conveniently placed links) already know that the Infinity Thanos looks like this, while this toy certainly does not. Ah, but that's why they said it's "inspired" by Thanos' modern appearance, not "representative of." Sculptor May Thamtarana started with the Infinity design, but went wild from there. The detail on this figure is as far above the modern costume as the modern costume is above the classic. The broad strokes are the same - golden skirt, shoulder-banana, stripe running between the two - but everything has been redone to a higher standard. It's like they were trying to "moviefy" the comic costume, and it really turned out great. The lines on the suit make it clear that this is some sort of protective armor, not just cloth, and his skirt is nearly "Jack Kirby"-ish in its intricate overlapping details (which is funny, since Thanos is one of the characters Kirby never in his life drew). His knees, boots, and right glove are equally armored, and they all look terrific. Yes, the fact that we specified his right hand tells you what's coming next: the left hand. Possibly the most famous left hand in comics. It's the Infinity Gauntlet, complete with all six gems on the back. Rather than being a match for the right glove, this one looks like cloth with an armored plate on the back - in other words, like a jumped-up version of the way it originally looked in the comics. However, the colors are messed up. 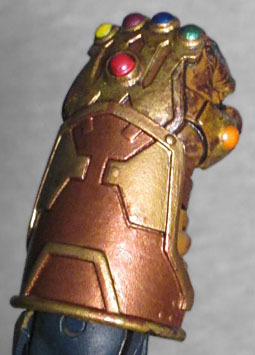 Look back through all the previous Infinity Gauntlets action figures have worn, and you'll see they stick to the same style guide: red Power gem on the thumb, yellow Reality gem on the forefinger, blue Mind gem, purple Space gem, orange Time gem, and the green Soul gem on the back of the hand. Yes, the movie Gauntlet changes that order up, but this toy doesn't match that, either. Here it goes orange-green-blue-purple-yellow-red, like whoever designed the paint master just put them in whatever order they felt like. Obviously that isn't something that ruins the figure, but it's worth noting. 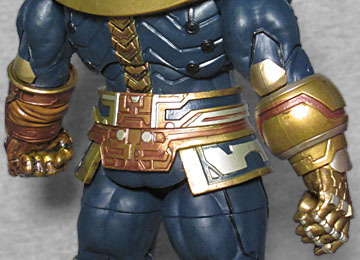 The paint on Thanos' suit is a lovely dark blue with black outlines, and there are at least four different shades of gold on his armor. There are some splotches that look like paint errors, but judging by the prototype images, they're meant to be battle damage. His skin is very pale, and his eyes are nearly human, rather than black holes with blue lights shining within them - again, more movie influence showing through. The figure includes two heads, and no, they don't have different expressions - one of them is wearing his helmet, and the other is bare. Go home, Thanos designers; you're drunk. Okay, technically the expressions are different, too, but only in that one is a huge grin and the other is a smirk. Seriously, what's up with everybody ignoring his more common dour look? Articulation has really improved since the last time Marvel Select made a Thanos: the figure has swivel/hinge ankles, swivels under his boot-cuffs, double-hinged knees, swivel thighs, H-hips, a swivel/hinge chest in place of a waist, swivel/hinge wrists (with the gloves being floating pieces so they can turn along with the hands), hinged elbows, swivel biceps, swivel/hinge shoulders, and a double-balljointed neck. Honestly, that's just as much movement as you'd expect from a Marvel Legend. Another thing you'd expect from a Marvel Legend? The size. Apparently the intention was to make the toy closer to Thanos' traditional comic height - in the books, he's big, but not wildly big, so this figure is a scant 7⅝" tall. In Marvel Select's 7" scale, that translates to 6'6", right on target for his official comicbook height. Of course, if you mix him with your Marvel Legends, he looks even better! 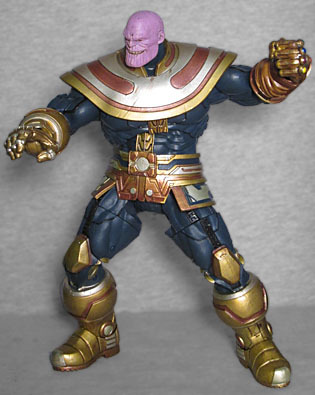 Thanos has no accessories, other than the second head. 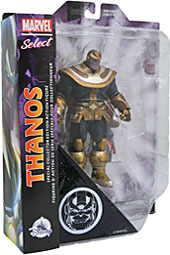 There's no non-Gauntlet hand, no Madame Death, no little chunk of planet for him to stand on... it's just Thanos, by himself in a package that's actually smaller than the normal Select releases. No kidding! It's the same width and height, but it's shallower by an inch or two. So it will fit in with all their other "bookshelf" packaging, but it will be noticably thinner. This may be because Thanos is a Disney Store exclusive, and they wanted more compact packaging, so they could fit more on each peg. Eh, doesn't matter to us - the figure inside is what matters, and the figure inside is good. He definitely feels like he was designed to cash in on the MCU Thanos design, but... so what? He's cool.